(BBC) – The Food Chain investigates the rise of eating disorders in China. Is this an inevitable consequence of economic development? And if so, why are eating disorders still all too often seen as a rich white woman’s problem? Manya Koetse scours trends on Chinese internet sites and social media for her website ‘What’s on Weibo’. She tells Emily Thomas about the recent craze for live binge-eating among young Chinese women and how some of this is disturbingly followed by ‘purging’. Why do they call themselves ‘rabbits’? And why does no one use the term ‘eating disorder’ when talking about these trends? This is an online radio documentary. 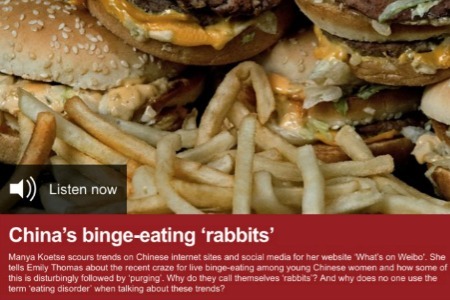 To listen to a short fragment on China’s binge-eating rabbits by Manya Koetse, click here: https://www.bbc.co.uk/radio/play/p06mw03b . To listen to the full documentary, please click here: https://www.bbc.co.uk/radio/play/p06mw03b.